Even you stay far away from your mom, order online this gift of Breathtaking Silver Plated Glasses with 200 gms. Dry Fruits and a 7 inch Tray and convey your heartfelt wishes to your mom on this Mothers Day. Even you stay far away from your mom, order online this gift of Breathtaking Silver Plated Glasses with 400 gms. 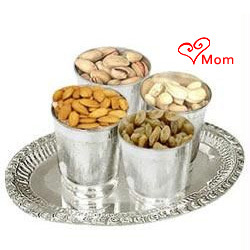 Dry Fruits and a 7 inch Tray and convey your heartfelt wishes to your mom on this Mothers Day.